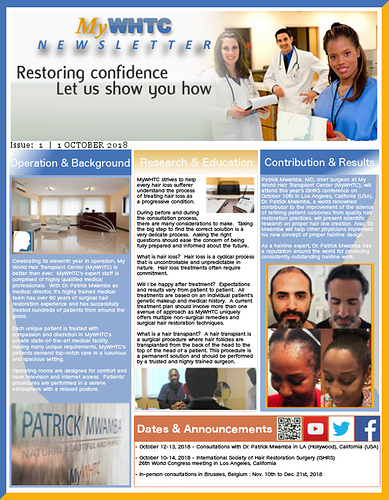 MyWHTC Clinic and Dr. Patrick Mwamba release its hair loss newsletter. The organization is striving to help hair loss sufferers through educating the entire hair loss community. Celebrating its eleventh year in operation, My World Hair Transplant Center (MyWHTC) is better than ever. MyWHTC’s expert staff is comprised of highly qualified medical professionals. With Dr. Patrick Mwamba as medical director, it’s highly trained medical team has over 60 years of surgical hair restoration experience and has successfully treated hundreds of patients from around the globe. For additional information, visit http://www.mywhtc.com.